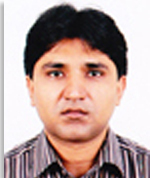 Dr. Ayyaz Muhammad is currently working as Associate Professor and engaged in imparting technical knowledge and skills to chemical engineering students at graduate and postgraduate levels in the areas of Separation Processes, Fuel Engineering, Fluid & Particle Mechanics, Chemical Engineering Principles, Instrumental Techniques in Engineering Research and Polymer Synthesis/Characterization, Rheology and Processing in the prestigious Institute of Chemical Engineering & Technology (ICE&T) at PU. He got his BS.c (Engg. ), Chem. Engg. degree in January 2001 from ICE&T and joined the Institute as lecturer in February 2002 after one year Industrial experience of Textile processing and polyester manufacturing. He completed his M.Sc (Engg. ), Chem. Engg. degree from I.C.E&T in 2003 and earned two gold medals after securing first position. He completed his PhD on scholarship from PETRONAS, Malaysia in the area of natural gas purification (CO2 capture high pressure technology) using novel solvents. He has published research papers in international/national peer reviewed journals and participated in a number of conferences, seminars, workshops and symposiums. He has also participated in three extensive trainings at HEC (Islamabad & Lahore) and AIT (Thailand) under Faculty Professional Development Program (MT-FPDP) by HEC and certified as master trainer to cascade the continuous professional development (CPD) courses at the university level. He is member of Pakistan Engineering Council (PEC), Pakistan Institute of Chemical Engineers (PIChE), Pakistan Engineering Congress, Pakistan Engineers Forum (PEF) and International Association of Engineers (IAE).